On January 12, 1934, British officials entered the cell of their captured revolutionary and brutally tortured him by breaking all his teeth, limbs and joints with hammer. The torture was so cruel and painful that the revolutionary couldn’t even scream. The revolutionary was hanged unconsciously and later his dead body was put in a metallic cage and was thrown into sea. What was such fear in minds of British that they had to brutally hang the revolutionary? This revolutionary was none other than Surya Sen, the valiant Bengali revolutionary who shook the British Empire by simultaneously attacking British cantonment, European club, Telegraph office, railway line and armory in Chittagong. Through this revolt, Surya Sen had created a strong awakening in minds of Indians to lift up weapons against the tyrant British supremacy. The martyrdom of Bagha Jatin & Khudiram Bose had inspired several bengali youngsters to plunge themselves in the freedom struggle and Surya Sen was one of them. Surya Sen’s only dream was to make his nation free from the grip of British and his first initiative was to attack the British resources and make Chittagong Independent. A teacher by profession, Surya Sen was fondly known as Masterda (teacher brother) who inspired and motivated students by narrating the stories of famous revolutionaries like Khudiram Bose. He participated in all the freedom movements and activities of Indian National Congress and highly admired the principles of Mahatma Gandhi. But his dreams were short lived. The violent Chauri Chaura Incident not only hurt Gandhiji, but also compelled him to withdraw the non co-operation movement. With the coming times, Surya Sen realized that revolutionary action is only the way to resist the British force. Such was his fervour for freedom struggle that he even sacrificed his marital happiness for cause of independence. Very less is written about the personal life of Surya Sen. His wife Pushpa Kuntala couldn’t bear his separation and breathed her last in a very young age. It is been said that Surya Sen preserved the belongings of his late wife and remembered her often. It is very sad to know that despite making so much painful sacrifices, Surya Sen never got the due and familiarity he deserved for. The initiative and action plan of Surya Sen was supported by his fellow members and colleagues- Ganesh Ghosh, Ambika Chakravarti, Anant Singh, Lokenath Bal, Nirmal Sen and prominent women revolutionaries like Kalpana Dutta and Pritilata Waddedar. 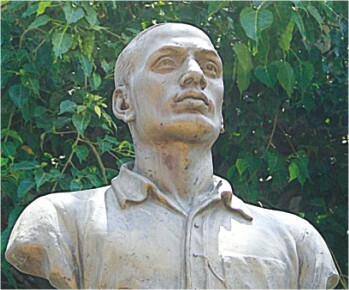 With help of bunch of teenagers, Surya Sen devised a strategy to raid the British armoury, cantonment, telegraph office, railway line and European club on the same day – 18 April 1930 and free their homeland Chittagong from British Empire .Though the raid was successful, the revolutionaries later realized that there were weapons, but no ammunition. Collecting the minimum weapons, Surya Sen and his team confronted the British army and managed to hoist the Indian Flag in police armoury. After the raid, Surya Sen and his group marched to Jalalabad Hills where they again had to face the bullets fired by the British Army. Several teenage revolutionaries lost their lives in the encounter and Tegra, the younger brother of Lokenath Bal was one of them. Later a revolutionary among the group of Surya Sen betrayed him by giving clues and information about their activities to the British. Slowly all the members were captured or killed in the encounter planned by the British. Even Pritilata Waddedar sacrificed her life during the attack on Pahartali European Club. Though his efforts didn’t succeed, his dream to free India finally came true on 15th August 1947. It is very sad to know that the effort of the Chittagong martyrs hasn’t been told to young generation in detail. Literary Adaptations: The Chittagong armoury raid was been retold into a novel called – Do or Die : The Chittagong Uprising, written by Manini Chatterjee. 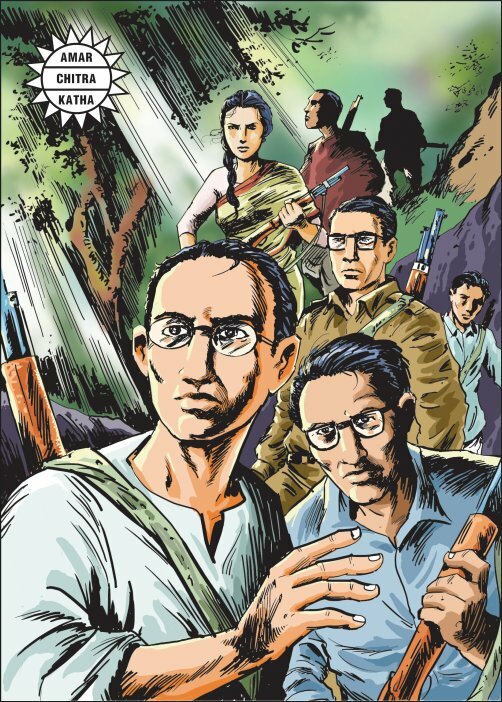 Even India Book House published a graphical story book on life, struggle and martyrdom of Surya Sen. Recently a Hindi motion picture: Khelein Hum jee jaan se, directed by Ashutosh Gowariker was based on Chittagong uprising and how Surya Sen played a pivotal role in attacking the British resources with full might. Even Bedrata Pain’s movie – Chittagong was based on Chittagong armoury raid. Even the movie ‘Khelein Hum Jee Jaan Sey’ was equally inspiring and retold the legend of Surya Sen whose efforts got dispersed in pages of history. Abhishek Bachchan portrayed the role of Surya Sen with perfection and showcased the patriotic emotions with finesse. Manoj Bajpayee’s performance as Surya Sen in 2012 movie ‘Chittagong’ made ‘Masterda’ was more believable and inspiring. Though Bollywood has come up with movies on Chittagong Uprising, a full fledged biopic on ‘Masterda’ Surya Sen is yet to be made. Through this blog post, I have taken a small, humble effort to inform you about the martyrdom of a brave son of motherland who sacrificed everything for sake of our nation’s independence. I am looking forward to write more blog posts on revolutionaries like Khudiram Bose, Veena Das, Jatin Das, Sukhdev, Babu Ghenu and make their efforts informed to the world. Hope you support me in this initiative by reading these blog posts and convey your suggestions. Even million of words will fall short to praise the valor, courage, martyrdom and unconditional love of Surya Sen for his country. He not only gave up his life, but also sacrificed all the worldly pleasures, giving priority for country’s freedom. In today’s corrupt age, it is hard to find even a one Indian who has the qualities of Surya Sen. Patriots like Surya Sen are one in a million. Long Live India! Long Live Surya Sen.
“The martyrdom of Bhagat Singh on 23rd March 1931 has inspired several freedom fighters to plunge themselves in the freedom struggle and Surya Sen was one of them.” With all respect to your honest endeavor, kindly let me inform you that the above sentence somehow belittles the selfless, beyond horizon sacrifice of this great son of India for the cause of his motherland. Nothing short of a Surya Sen in the entire history of mankind could have made a Surya Sen. The name of his native village is ‘Noapara’ which lies in the sub-district of Raozan in the district of Chattagram(Chittagong). I am a proud son of Bidrohee Chattala as well. Thank you for the post. Today is the anniversary day of the attack on the pahartali European Club. I salute to this whole secred gang of revolutionaries, who sacrificed their lives for our freedom. chittagong armoury raid was carried out on 18 april 1930, before the martyrdom of bhagat singh. so one cannot say that master da was inspired by bhagat singh’s martyrdom. of course bhagat singh was a great revolutionary & so was master da surjyo sen! no need to compare them. both are great! Wonderful! I myself is a great follower of Masterda. it is sad that people have forgotten him. If people like prashant come up, he can become known to many. 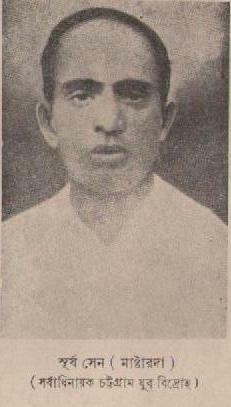 Master da Surjyo Sen. How little we know about this hero ? His dream of freedom is still far away from us. Without people like him we wont be living in a free country. Mastarda we need you again …………. LONG LIVE MASTER DA…WE BECOME SAD WHEN WE SEE THE CURRENT STATE OF OUR COUNTRY…WE ARE FORCED TO THINK THAT ALL SACRIFICES WERE IN VAIN??? AND USELESS? ?….IT IS TIME TO PONDER AND THINK ON MORAL VALUES AND BASIC VALUES OF LIFE. Brilliant….inspiring stuff…surya sen is a badly underrated revolutionary of those times and his strategy was indeed peerless…Love this article’s attention to detail and actual events…..
Awesome… Inspiring…. I liked the post a lot…Might be he has left quiet a year ago still he is alive amongst us…..
this is the first place where the name of Masterda’s wife is mentioned. no where there is a details of his personal life. sad that today nobody knows where this beloved son of mother India lived in chittagong.